When you right click a panel, a context menu will appear. Aside from the menu items you'll find on the standard windows taskbar, you will also see three new items at the bottom. These items are everyting you need to configure panels. When you unlock a panel, you will not only be able to move it to any edge of any screen, you will also put the tiles in edit mode. When a panel is locked, you can still move it if you hold down Ctrl on your keyboard. Also, you can put individual tiles in edit mode by long pressing them. Long press again when done. 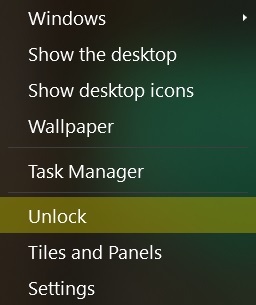 When the panel is unlocked, an icon menu will appear as you move the mouse over a tile. 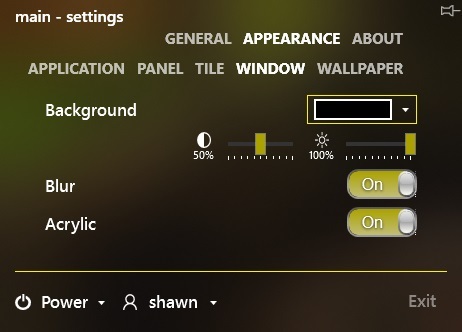 Click the settings icon to access the settings for the tile. 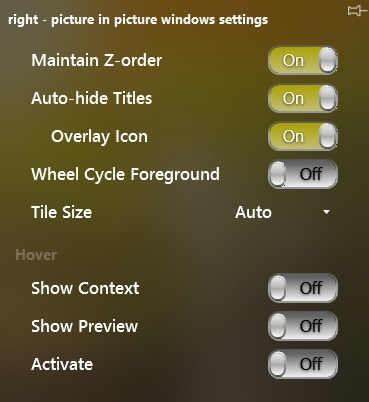 See Tile Settings below. Click the - icon to remove the tile. Click the vertical icon to adjust the height, horizontal icon for width. When set to Auto, the tile will fill the panel up to its largest size. Add a new tile to the panel by clicking the + icon under the Inactive section. This will move the item to the Active section. If a tile has … after the name, you can add multiple instances. To move the tile position on the panel, click the up and down icons to the right of the active items. To add a panel, click the + icon and give it a name. Click the check icon to save. Click the trash icon to remove a panel. Toggle the panel visibility by clicking the on off toggle button. Enable to always start Panels after logging in. Enable to hide the windows taskbar. When the panel is unlocked, it can be moved and tiles can be sized/configured. Enable to hide the panel when not in use. Enable to keep the panel visible on all desktops. The layer or z-order of the panel in relation to other windows. Set the position of the panel. 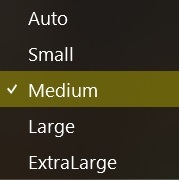 Adjust the width/height of the panel. Adjust the scale of the panel. 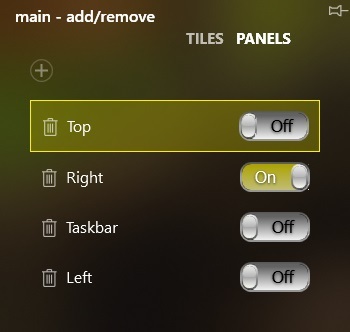 Use actions to control any window on your desktop. Grab the cross hairs and drop them on a window to create new entries. 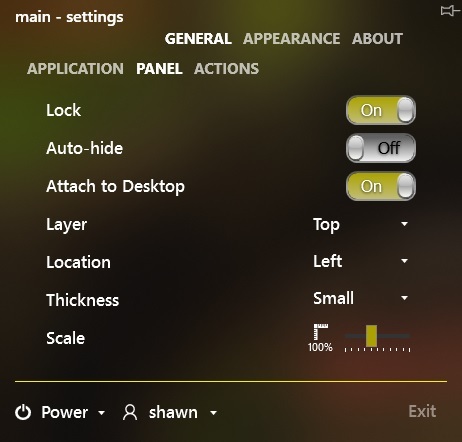 Panels finds windows by using one or more of the settings in the Identify section. Once configured, panels will execute the specified actions whenever the window appears. The name/path of the process. Text that appears in the title bar of the application. The new top coordinate of the window. The desktop number the window should be moved to. Activate the specified desktop when the window is moved. The new state of the window. The new layer or z-order of the window in relation to other windows. Change the theme of the Panel. 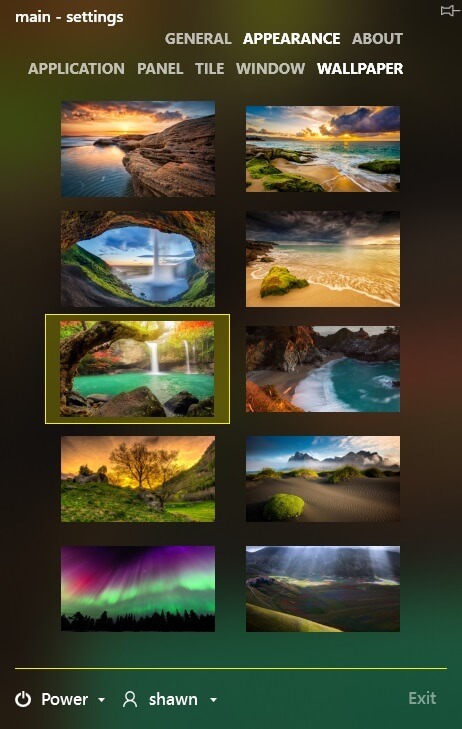 Panels comes with default themes, but you can also create your own. Click the + icon and enter a name for the new theme. 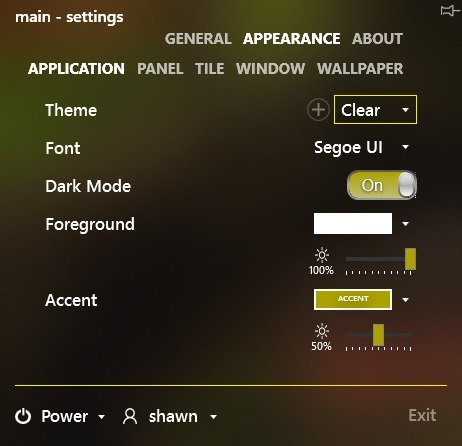 This will copy the current theme settings. Change the font for all items on the panel. When enabled, Panels will darken the panel background color and lighten the foreground color. Disable to reverse. The foreground (text) color brightness level. The accent color brightness level. The panel background color opacity level. The panel background color brightness level. When enabled, items under the panel will be blurred. When enabled, items under the panel will be very blurred. The margin level of all tiles for the panel. The background color of all tiles for the panel. The background color opacity level of all tiles for the panel. The background color brightness level of all tiles for the panel. The border color of all tiles for the panel. The border color brightness level of all tiles for the panel. The border thickness of all tiles for the panel. The corner radius (corner rounding) of all tiles for the panel. When enabled, the panel background color under all tiles will be transparent. Background color for all of Panels windows. 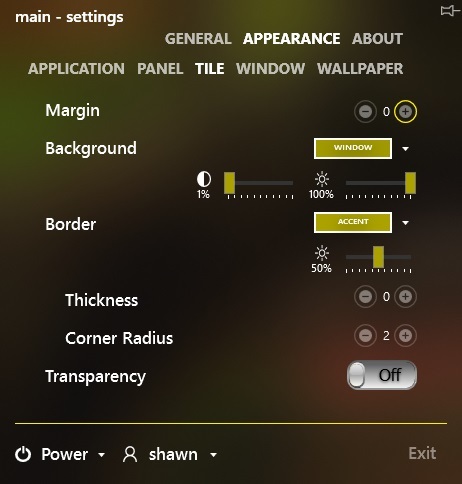 Background color brightness level for all of Panels windows. When enabled, items under all of Panels windows will be blurred. When enabled, items under all of Panels Windows will be very blurred. 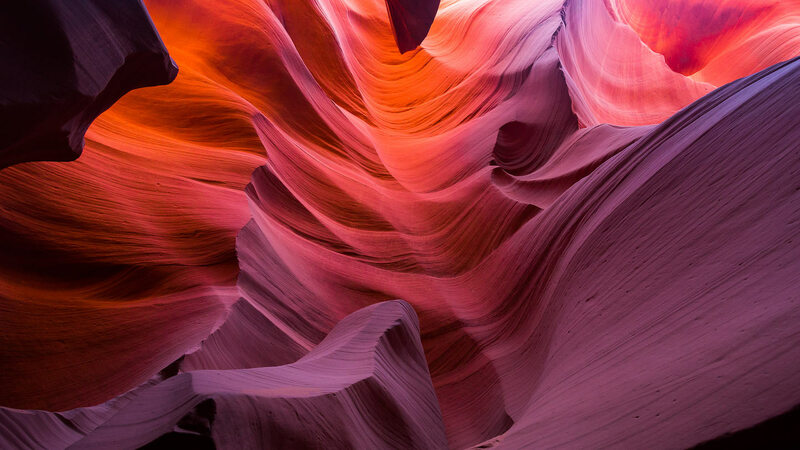 Just click the wallpaper you want to use for your desktop background. Switch between 12 hour and 24 hour time. Turn on to give the clock a digital look. 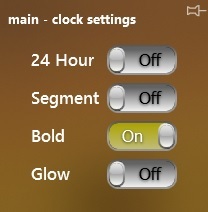 Enable bold font for the time. Glow effect for the time. 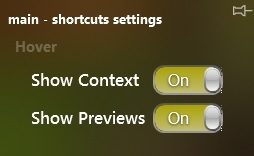 If on, a context menu will appear when the mouse hovers over a shortcut. If on and an instance of the shortcut is running, a live preview will appear when the mouse hovers over a shortcut. Show/Hide the network icon. This icon will be replaced by the network icon from the Windows taskbar tray if the Taskbar Tray setting is on. Show/Hide the power icon. The icon will only show on laptops. This icon will be replaced by the power icon from the Windows taskbar tray if the Taskbar Tray setting is on. 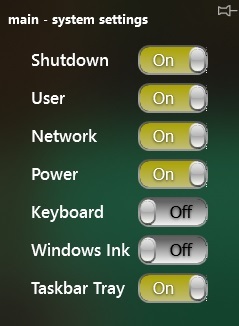 Show/Hide the Windows Ink icon. 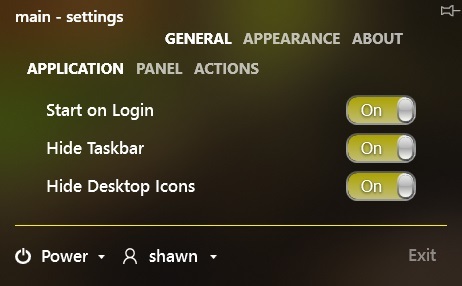 Show/Hide icons from the Windows taskbar tray. If on, the virtual desktop numbers will be displayed. Change the size of the virtual desktops within the tile. If on, the order of the items will match the z-order of the windows on the desktop. If on, the title bar will hide when not in use. If on, the windows icon will be overlaid on the items. If on, the mouse wheel can be used to cycle through the windows when the mouse pointer is over the control. Change the size of the windows within the tile. 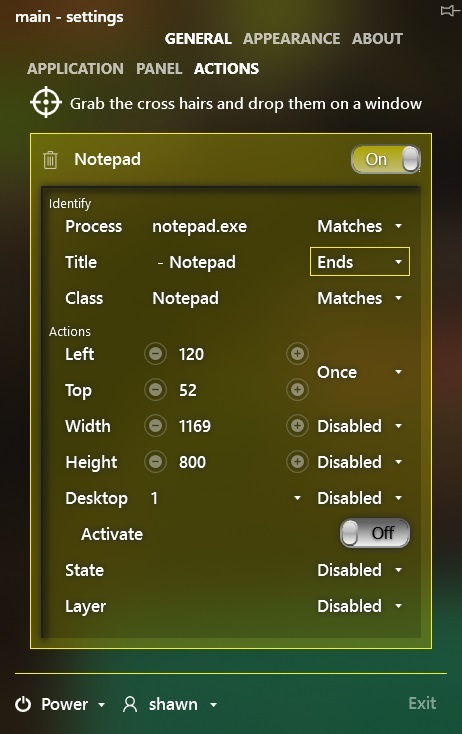 If on, a context menu will appear when the mouse hovers over a window. If on, a live window preview will appear when the mouse hovers over an item. If on, the window will become the foreground window when the mouse hovers over an item. If on, the weather will be show in Celsius. Fahrenheit when off.